When the cold winter winds start to blow and temperature drops below zero, many people move south to spend winter in more temperate climate. Many bird species also migrate to the south, enjoying warmer weather and the southern abundance of food. Many bird species which are familiar to us in summer – for example the yellow warbler, red-eyed vireo, northern oriole, chimney swift, barn swallow and crested flycatcher, but also some birds of prey like the broad-winged hawk, spend their winters in the south. Birds which do not migrate for the winter include many species that are here all year round like the red-bellied, downy, and pileated woodpeckers, the barred, screech, and horned owls and other well-known birds, including the northern cardinal, blue jay , tufted titmouse, chickadee, white-breasted nuthatch. If you notice flocks of robins in your back yard or in the woods, those might actually be birds from farther north that came south for the winter. Many people enjoy taking care of and feeding birds in winter and are interested in what they should feed them with. Feeding birds in winter will attract these common guests at your winter feeders. This well-known large woodpecker features a black and white barred back, but has a gray face and underparts. The bird gets its name from a red spot on its belly, which can vary in size and color, and is sometimes hard to spot. The male members of the species also have a red top of the head, while the females have a red nape and gray crown. These woodpeckers prefer woods with groves of large trees where they can find ants, beetles but also berries, grapes and cherries. The red-bellied woodpecker is a very vocal bird and its call can often be heard close to the feeding spots. They are particularly attracted to suet. This common woodpecker features a pattern of black and white. They have a black cap, black eye stripe and a funny black moustache. Male individuals sport a red patch on the nape which is absent in females. The call of the downy woodpecker sounds like a high “pik” sound followed by a series of “ki ki” sounds. They usually live near gardens, small woods and general urban areas. They are very useful because they feed on pests such as aphids and insect eggs, but also spiders, acorns, sap and berries. Your feeder will attract them if you put out suet, cornbread and peanut butter. 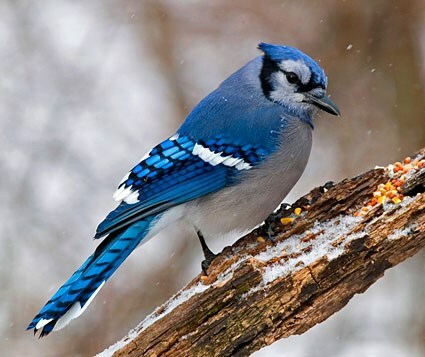 The blue jay is very recognizable because of its distinctive blue crest, black and white necklace, blue back and especially its long blue tail. They are quite known for their various call sounds ranging from cries to lisping notes. They are even capable of imitating hawk calls. Their habitat is mainly woods but they also live in suburban areas and backyards. Their diet is very varied and they feed on beetles, spiders and insects but also on acorns, blueberries and currants. They will come to your feeder if you put out suet and peanuts. Mourning doves are gray-brown in color. They usually have small heads and bills, with long pointed wings, and long tapered tails. From close up you can see a black spot on both sides of their head. Their most distinctive feature is a call which sounds like a sad “whoo, whoo, whoo”. These are swiftly flying birds which produce an almost musical swishing with their wings. Their habitat is varied, and includes woods, rural places and urban areas. They primarily feed on seeds, and are useful because they consume the seeds of most weeds. Mourning doves usually move in small flocks and can be seen looking for seeds on the ground by you feeders. These friendly small birds are very recognizable because of their black caps, white bibs and cheeks. Their call, by which they are named, “chick-a-dee” is absolutely unmistakable. They can live either in forest or residential areas, in which case they are easily tamed to become feeder birds. They mostly eat caterpillars, insects eggs, beetles, ants, aphids with some fruit and seeds. They will visit your feeder looking for suet, sunflower seeds and peanut butter. The white-breasted nuthatch is easy to spot and recognize, since this short-tailed bird is in a habit of searching for insects while walking down a tree trunk headfirst. They feature a black cap and nape which stands in sharp contrast with its white breast and the sides of its face. Their call is loud, nasal and sounds like “yank yank”. The nuthatch mostly lives around woodlands, parks and suburban areas. They consume acorns, moths, tent caterpillars and other insects. They are easily tamed and can even be taught to eat peanut and sunflower seeds from one’s hand. One of the most common feeder birds, featuring a gray back, white front, rusty flanks and a very large and prominent crest. These birds equally live in woodlands, city park areas and residential areas. Their signature whistle sounds like “peter, peter”. Tufted titmice will feed on caterpillars, beetles, blackberries, cherries, acorns and beechnuts. They consume nuts by holding them under their feet and opening them with blows of their bill. They come to feeders looking for suet and bread, but will also take sunflower seeds which they will hide in a place of their choosing, most likely some tree cavity. Famous for its vivid scarlet color, red crest and the black patch at the base of its thick red bill. The more subdued colored female is olive-gray in color with a pink bill and a reddish tint to her wings, face, tail and crest. Cardinals are well known for their very varied songs which can be heard all year round. Even the female members of the species sing. They inhabit residential areas and places with abundant thickets and bushes. They feed on aphids, beetles, cutworms, corn, oats and weed seeds. They will happily come to your feeder for some sunflower seeds. Adult song sparrows have brown backs and tails with white streaked underparts. On the breast they feature an easily seen dark spot. These birds prefer locations with bushy cover and water nearby, but they will also visit residential gardens and yards. They feed on beetles, flies, ants, weed seeds, fruit and grains. They will visit your feeder looking for seeds. Another bird species introduced from Europe. Although streaked black during winter, by spring the bird will have acquired its iridescent black spring plumage. Later in spring, the starling will have a bright yellow beak. They were named starlings because they resemble a falling star. During winter, starlings gather in flocks numbering several hundred. They are regular visitors to the feeders, especially in urban residential areas. They especially love cracked corn. Sometimes referred to as a “snowbird,” the junco features slate gray feathers, with a prominent white bill, belly and outer tail feathers. During winter they live in woods and clearings, but may visit gardens or parks with feeders. Usually coming in flocks, the juncos can be seen on the ground where they scratch for seeds and small insects. The male member of the species features a lush raspberry colored head, throat and breast while having white underparts and a brown and red streaked back. The female is more subdued in color, with overall brown feathers and white streaked underparts. Small flocks of these birds are commonly seen inhabiting tops of evergreens such as the Norway spruce. Purple finches mostly feed on seeds but will also eat fruit, beetles and birch and maple buds. They will seek additional seeds at your feeder, where they can be seen alongside another finch, the house finch. Goldfinches change their summer yellow plumes to a much more muted color in winter. The winters birds are more olive brown with yellowish heads and black wings. They prefer to live near to water, but also in woods and park areas. They feed on seeds of thistle, conifers, asters and dandelions. These birds mostly live in flocks. They will look for sunflower seeds in your feeders. With its gray breast, a prominent yellow patch between the eyes ant the bill and a distinctive white throat that gives it its name, this is an easily recognizable bird. It also has a striped head, which can be either black and white or brown and tan. This sparrow species actually nests all the way from Canada to Yukon. It can be heard singing its well-known “old sam peabody” song well into April, before the species migrates to the north for summer. They mostly eat fruit, weed seeds and insects. White-breasted sparrows are common visitors at feeders, especially in bad weather. They will enjoy sunflower seeds. The evening grosbeak is hard to miss with its conical, chalky yellow bill, black wings featuring a large white patch, yellow forehead and brown belly. The grosbeak can be found nesting from Canada to New England, while they spend the winter months in the southern states. During winter, flocks ranging from a few dozen to over a hundred birds can be found all over West Virginia. These birds will devour any sunflower seeds you leave for them. Originally introduced from Europe, this bird is not actually a sparrow but rather belongs to a family called weavers, because some species in this group construct complex woven nests. These are very adaptable birds which thrive in urban areas and often compete with American bluebirds for nesting sites. The male of the species features a black throat and upper breast, while the females are brown. Usually they visit the feeders in flocks, and are very interested in bread. What’s the best location for your bird feeder? This depends on where you want to see your birds feed. Pick a location that is easily accessible to you so you can refill the feeders even in harsh weather. Also, look for a place where the discarded remnants will not be difficult to clean up. Make sure that the neighborhood cats can’t reach the feeders. Feeding birds in winter, when should you start ? There isn’t a specific time to start, since birds enjoy additional food all year round, especially during bad weather. However, if you put your feeders out earlier, in September for example, the birds will come sooner and you can enjoy the view. Don’t dishearten if the birds don’t come straight away; they might need time to find the feeders. Take the time to choose the feeder appropriate for distinct species and don’t throw the food on the ground because it will be spoiled by damp, mold and pesticides. Not to mention that it will attract pests and rodents. What kind of bird feeders should I get? For peanuts you can use a wire mesh cage, for thistle or black sunflower seed the tube feeder is best and there are also a tray fruit feeder and a platform feeder. Different species of birds will be attracted to different feeders and various foods you put in them. If you want to attract a large variety of birds, the best option is to have several separate feeders with different foods. Suet feeders will attract: woodpeckers, chickadees, wrens, nuthatches, cardinals, doves and goldfinches. Peanut butter suet will attract: woodpeckers, goldfinches, juncos, cardinals, jays and bluebirds. Platform feeders with sunflower seed will attract: cardinals, house finches, nuthatches, mourning doves, woodpeckers, purple finches, song sparrows, titmice, chickadees, goldfinches, evening grosbeaks, jays and white-throated sparrows. A tray feeder with fruit will attract: woodpeckers, starlings, bluebirds, cardinals and jays. Several types with different food should be enough to keep your birds fed. If you remove the perches from tube feeders, you will restrict the feeding to birds that can cling, like finches, titmice, chickadees and woodpeckers. Different species will gladly feed together, but sometimes larger birds like cardinals or blue jays may chase away the smaller species. Bird food can be bought in your local pet store or online. There is another thing you can give your birds, by putting a few drops eCOTRITION Vita-Sol Multi-Vitamin for Birds in the birds’ fresh water bath you can give them extra vitamins. Remember, the birds need fresh water even during winter. Feeding birds in winter is a commitment. In order to prevent spreading avian disease, please take care to regularly clean the feeders and remove any moldy food. - Before putting them out, clean the feeders with soap and warm water. - Clean them again if they become wet and seeds start sticking to them. - Clean the feeder if you think the food inside has spoiled. - In case you notice any sick birds, stop putting out food for a couple of days. - Food remains under the feeders might attract pests like mice or rats. Keep the ground beneath the feeders clean. Once again, do not forget that birds always need water. A birdbath with unfrozen water will help to attract many more birds. If you have sufficient space to construct a small pond, you might attract waterfowl like the ring-necked duck, wood duck, black duck, hooded merganser or maybe even migrating green and blue winged teals. Feeding birds in winter is not difficult, and the birds are going to be very grateful for it.